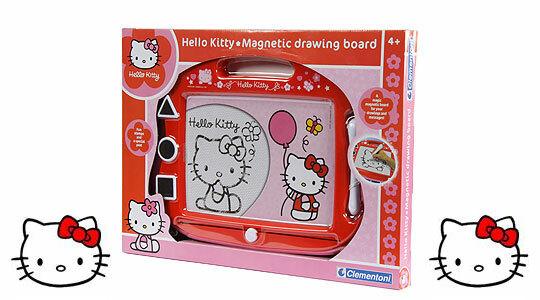 Home Bargains are selling this Hello Kitty magnetic drawing board for £7.99, rather than its usual full price of £12.99. My youngest niece just ADORES anything Hello Kitty; I wonder whether she already has one or not? She also loves to doodle and draw and her mum is constantly stashing away scrap paper for her to use when her drawing moments strike. Then of course there's the setting everything up - covering the table, getting out the pens, pencils or paints let alone tidying everything away five minutes later when they've moved on to another activity; I remember those days well! So, a Hello Kitty magnetic drawing board would be just perfect for her and those fleeting arty urges - just take put the board, doodle away and draw anything you like with the pen, or use the stamps to create Hello Kitty patterns. No mess, no faff, just instant drawing fun - I;m also willing to bet you won't be able to resist drawing the odd doodle on it too. If you have a Home Bargains store near you then you can collect your Hello Kitty magnetic drawing board for free, or you can arrange to have it delivered to your home for no more than £2.95.